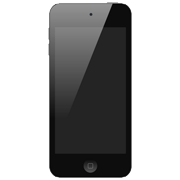 Looking for a solution to transfer music video from iphone 4 onto ipod touch 5g? 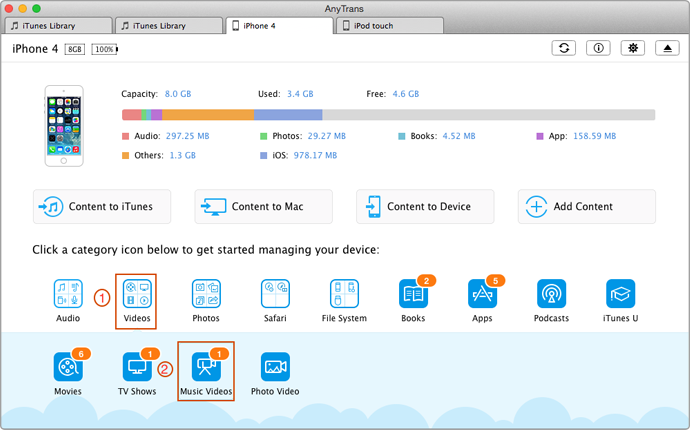 Read this guide on transferring music video from iphone 4 onto ipod touch 5g by using AnyTrans. I have iPhone 4 with a bunch of music videos on it. Now I have got a new iPod touch 5G saved onto my computer with iTunes. I am trying to transfer music video from iPhone 4 to iPod touch 5G, But I can't figure out how. I'm very frustrated that iTunes just doesn't support to transfer my own music from iPod back to computer. 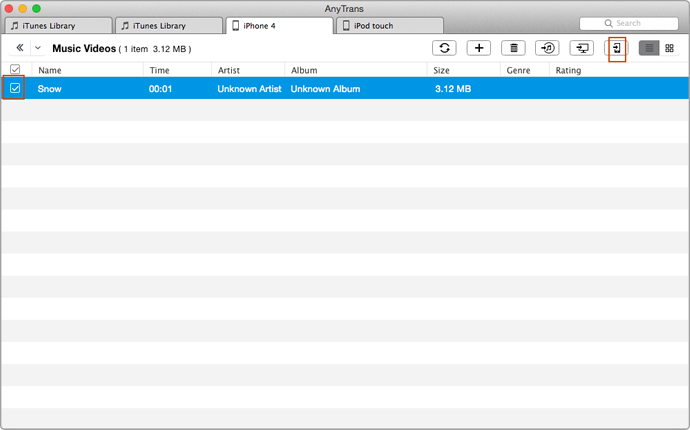 If you want to transfer music video from iPhone 4 to iPod touch 5G you'll need a decent third party App like AnyTrans. That is because Apple iTunes doesn't have such a function to transfer music video among devices. As long as you keep using iTunes, you'll find it is impossible to get music video transferred among multiple devices. 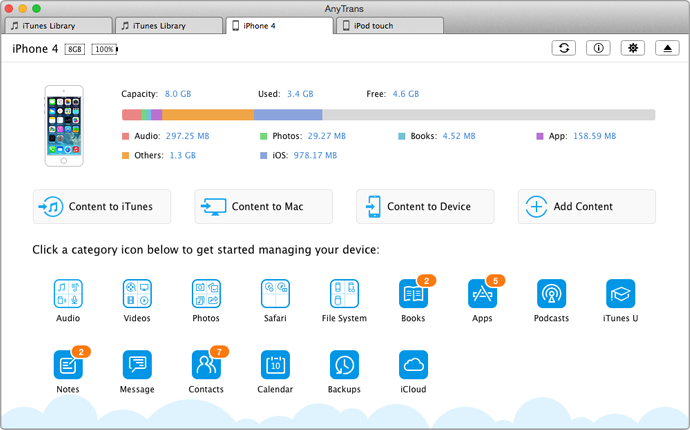 At this moment, you can simply find a versatile iTunes Alternative for iPhone/iPad/iPod management. We recommand you AnyTrans because of its flexibility. Thanks to supporting multiple devices at once, it will move music video from iPhone 4 to iPod touch 5G with one single click. We provide free download for AnyTrans so that you can try it without any charge. By the way, to use this app is pretty easy no matter you are an experienced user or not. After a few installation, you'll see below main interface of AnyTrans. Step 2:Click on "Videos" > choose the "Music Videos" to enter the manage page. AnyTrans will indicate your devices on the top side. Choose iPhone 4 and click its Music Video tab on the left side of the window and you'll review the relevant media contents. Highlight the music video files you choosed and click To Device option (Shortcut: Right click the mouse and select To Device). Then you can leave it alone and AnyTrans will auto transfer music video from iPhone 4 to iPod touch 5G.